I’m one of the first people to graduate with a Masters in Neuroscience as it’s a new degree here at Southampton. 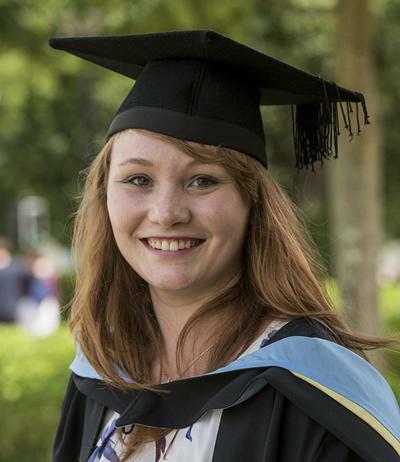 I started off studying Biomedical Sciences but staff advised me that if I had taken the right modules, I could specialise in neuroscience. I’m very interested in how the brain works and want to stay in research to find out more about what makes a person what they are. I won a prize from the Institute of Physiology for my work and I’m going to be starting a PhD at Warwick in the autumn examining memory. I’ve loved my four years at Southampton, the University is renowned for its high quality research and I’ve also appreciated how green the campus is, it’s a beautiful place to study. As well as my time here, I spent a year in industry at GSK in Stevenage looking at ways to monitor liver and kidney fibrosis. It wasn’t as easy as we had hoped but a very worthwhile year. University is a great place to try new things. I’ve taken part in competitions for ballroom and Latin dancing and have learned salsa and even belly dancing. I also hosted a show on Surge student radio on campus.